If I had a dollar for every arm exercise you can do at the gym, I'd probably have enough money to pay my grocery bill this month. FYI, that's a lot of money. I buy lots of organic kale. Frankly, there are too many options. Not that they don’t all have their place, but the sheer number can be confusing and overwhelming. The good news is that all you really need for a killer set of arms is a pair of dumbbells and these four moves. Before Arnold Schwarzenegger was a governor or a semi-passable actor (don't pretend like Kindergarten Cop was Oscar-worthy, folks), he was a professional bodybuilder who quite literally invented the Arnold press. Modest! This move, which is similar to a traditional shoulder press, is actually designed to better mimic a natural movement pattern as you press your arms over your head, and it has the brag-worthy benefit of hitting all three heads of your shoulder's deltoid muscle (anterior, lateral, and posterior). To perform an Arnold press, sit tall on a chair or bench, your feet planted shoulder-width apart, your core engaged. Holding a dumbbell in each hand, bend your elbows and position your hands in front of your shoulders, your palms facing your body, as if you just performed a dumbbell curl. This is the starting position. In a fluid, controlled motion, press the dumbbells up over your head, and as you do, rotate your palms inward, then forward as you complete the press, so that at the top of the motion, your arms are extended and your palms are facing outward, away from your body. Reverse the movement as you bring the dumbbells back to your shoulders, rotating your palms in, then toward your body as you lower the weights. Biceps 21s take a standard biceps curl to the next level by working the muscle through three separate ranges of motion that ultimately require more overall muscle engagement, control, and coordination. Biceps 21s require you to complete a total of 21 reps of biceps curls, but every seven reps, you change the range of motion, maximizing burn. Stand tall, holding a dumbbell in each hand, your feet hip-distance apart, your knees slightly bent. Position the dumbbells in front of your thighs, your palms facing away from your body, your elbows extended. Start the exercise by curling the dumbbells halfway up, stopping when your elbows form 90-degree angles. Reverse the movement and lower the dumbbells. Perform six more reps.
After the sixth rep, immediately curl the dumbbells through a full range of motion, bringing them all the way to your shoulder. From this position, lower the dumbbells halfway, stopping when your elbows are bent to 90 degrees. Reverse the movement and curl the dumbbells back to your shoulders. 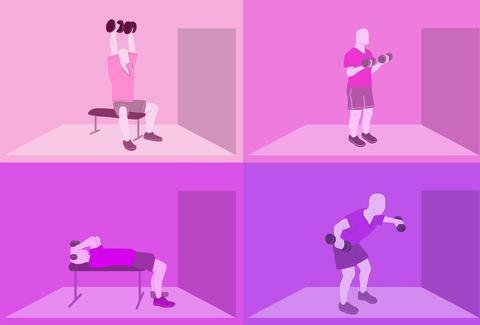 Perform six more reps -- you can probably guess that you're going to do seven reps for each range of motion. For the final seven reps in this set, you'll take the dumbbells through a full range of motion. Start by lowering the dumbbells all the way to your thighs, then perform seven total reps, curling the dumbbells all the way to your shoulders, then back again. Remember, you're not pausing or resting between each of the seven reps. You're performing the total 21 reps in a series without rest. Triceps skull crushers sound scary, but if you select an appropriate weight and use proper form, they're an excellent way to target your triceps muscles while also engaging the stabilizing muscles of your shoulders. Lie on a mat or bench with your knees bent, feet flat on the floor, holding a dumbbell in each hand at your chest, your palms facing toward each other. Press the dumbbells straight up over your chest, as if your arms are forming the number 11. You'll keep your upper arms fixed in this position throughout the exercise, only allowing your elbows to bend to change the position of your forearms and hands. Tighten your core and engage your shoulders and triceps before bending your elbows, lowering the dumbbells toward your head. When your elbows bend at roughly 90 degrees, reverse the action and press your arms up, extending your elbows and returning to start. It's easy to neglect the back of the shoulder, and while the Arnold press engages the rear delt (or posterior delt) to some degree, its main focus is the anterior and lateral delts. Supplementing your shoulder work with the rear-delt fly can help balance your shoulder work while improving your posture... especially if you spend a lot of time hunched forward in front of a computer. There are variations of the rear-delt fly, but if you're trying it for the first time, it's a good idea to start with a seated version to reduce possible strain on your low back. 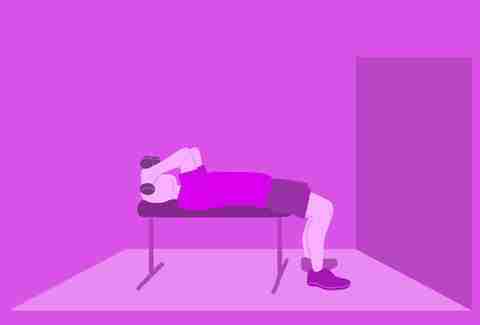 Sit on a bench or a chair with your knees bent, feet planted hip-width apart on the floor. Hold a dumbbell in each hand, resting them on your knees. Engage your core and tip forward from the hips, and as you do so, release the dumbbells from your knees, allowing your arms to hang straight down from your shoulders, with your palms facing inward. You'll hold this forward-leaning position throughout the exercise, so make sure your back is straight, forming a straight line from your hips to your head. From this position, roll your shoulders back to keep them from slouching forward, then with a slight bend in your elbows, lift the dumbbells up and out to the sides, squeezing your shoulder blades together as you raise your arms. At the top of the movement you'll form a "T" shape with your arms and body, as if you had wings. Hold for a count, then carefully lower the dumbbells back to their starting position. Laura Williams is an exercise physiologist and fitness writer whose arms are harder than diamonds thanks to these exercises. Connect on Twitter @girlsgonesporty.